Known as a 'real character', full of life both in reality and in his painting, George Luks was a leading figure in the New York art world in the early part of the 20th century. He did lively portraits and genre paintings of everyday people engaged in activity rather than self consciously posed. He was born in Williamsport, Pennsylvania, and his parents encouraged his obvious art talent. They also supported a group called the Molly Maguires, a secret-organization of Irish-Americans that tried to improve conditions for area miners. This exposure had an obvious influence on his later subject matter, which quite often showed "down and out" people. He studied in Europe for several years and was much influenced by the paintings of Rembrandt and Frans Hals. He then worked for the Philadelphia Press, doing quick, accurate reportorial sketches, a method that became his forte. He tried to study at the Pennsylvania Academy, but his rebellious nature resisted the discipline of formal study and he withdrew after one month. In Philadelphia, Luks became an illustrator with the Philadelphia Press and covered the Cuban war as an artist-correspondent. He also did comic strips and caricature. 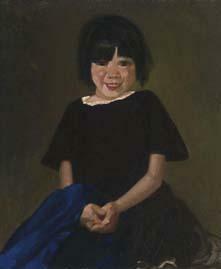 Among his close friends were John Sloan, Robert Henri, William Glackens and Everett Shinn. By 1896, with that group, Luks became a resident of New York City. There he began painting the people he saw on the street and joined with the Henri circle in depicting social realism, which became known as the Ash Can School. Also with Henri and Sloan and others, he was part of a highly controversial exhibition called The Eight at the Macbeth Gallery, which was a rebellion against the strictures of the National Academy.